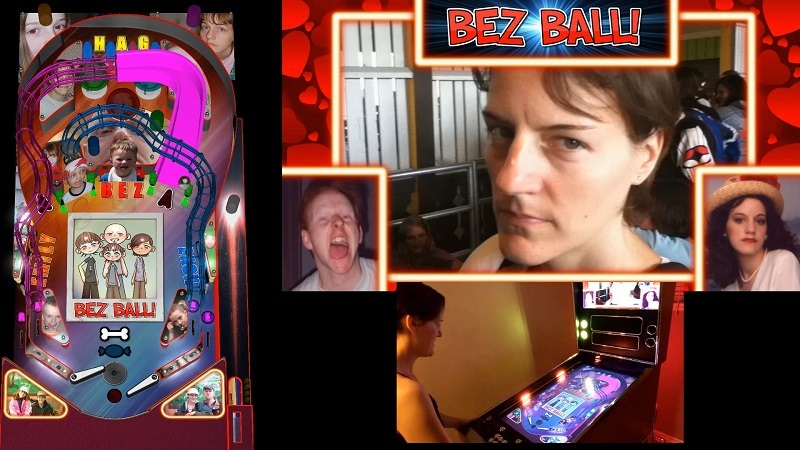 GoPinball.com • View topic - BEZ BALL! Funny new table. 20th Anniversary gift to my wife! BEZ BALL! Funny new table. 20th Anniversary gift to my wife! Post subject: BEZ BALL! Funny new table. 20th Anniversary gift to my wife! For my 20th Anniversary, I decided to do make a funny Future Pinball game for my wife... about her! This game has many modes, and a main overall objective. To defeat THE BEZ! (my wife ). She actually plays and completes the entire game! Happy anniversary Terry and Bez! This table was never meant to be a "serious" table, but something fun for my wife and kids. i've done a bunch of DOFLinx mods and now some Pinup Player mods to FP tables, so I was pretty familiar with the scripting part. Creating a table from scratch using nothing but the FP editor is something that was new. I learned a lot more about what you can and can't do with FP. Such as the Overlays can only be flat with the table's playfield (no angles), and the Holograms can only be transparent (not solid). Surfaces can also only be horizontal or vertical. So the only way to have videos on the playfield at an angle is to have an object behind the Hologram with a black backing. Like what Jaws or MOTU used. I have crazy respect for all the FP table authors out there and the dedication to their creations. Happy Anniversary, Terry. May the Beez be with you and your family!